We LOVE our Citrus Lane 8 month old baby boy box! Citrus Lane is a subscription box for kiddos that is tailored to the age and gender. 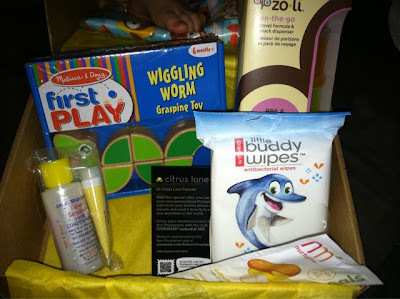 We love it because we get to try new quality toys and products! If you sign up for the subscription through this link, and use code TAKEHALF you will get your first box for ONLY $12.50!! Ive been buying honest diapers for my baby since I discovered them when she was 3 months old. To my opinion they are the most absorbent. They almost never leak and are very thin so my baby can walk comfortably with them. The large package is also a great deal if you buy online. It saves you money and the hassle to carry the box from the store because they are delivered to your home.